Green chickpea has high amount of carbohydrates, protein, moisture, fat, fibers, calcium, iron and vitamins. Weakness: Green chickpea is the good source of protein, minerals and vitamins. It removes weakness and provides energy. Weight Loss: Stomach remains full for long time due to green chickpea. We can avoid ourselves from over eating. It helps in weight loss. Digestion: We can get daily needs of half amount of fiber in one bowl of green chickpea. It cleans the digestive tract. 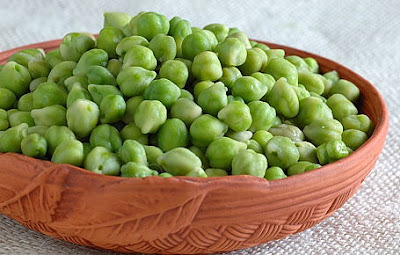 Anti-Oxidants: Green chickpea has good amount of vitamin, minerals and anti-oxidants. It protects us from diseases and avoids aging. Heart Problem: Research has shown that half bowl green chickpea reduces bad cholesterol level. It reduces the risk of heart diseases. Blood Sugar: One bowl of green chickpea is beneficial to control blood sugar level. Bones: Green chickpea has vitamin c. The regular intake of chickpea in breakfast strengthens the bones. Anemia: Green chickpea has high amount of iron. It is very beneficial in anemia. Intestine Cancer: It has fibers and minerals, which removes bad bacteria and protects us from cancer. Healthy Skin: Green chickpea has chlorophyll, vitamin A, E, C, K and B complex. It makes skin healthy.